This enclosure kit allows you to transform your current canopy or tent frame into an actual shelter. Complete with 2 side walls, a solid real panel, windows, and a double zippered front door panel, this shelter can be used for a wide variety of occasions. The white shelter enclosure kit is made of triple-layered waterproof polyethylene fabric that has been UV treated. 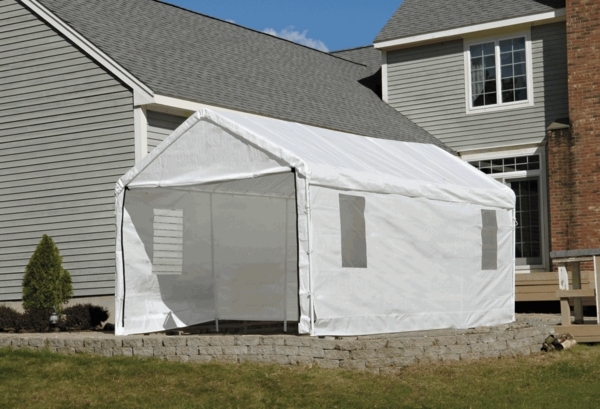 This enclosure will help to protect your event from wind, rain, and sun. Easy to put up, keeps us dry, but we will really know when winter comes, right now it makes a great hot house. ConsWish corner were a little better fit but it may work better with wind.